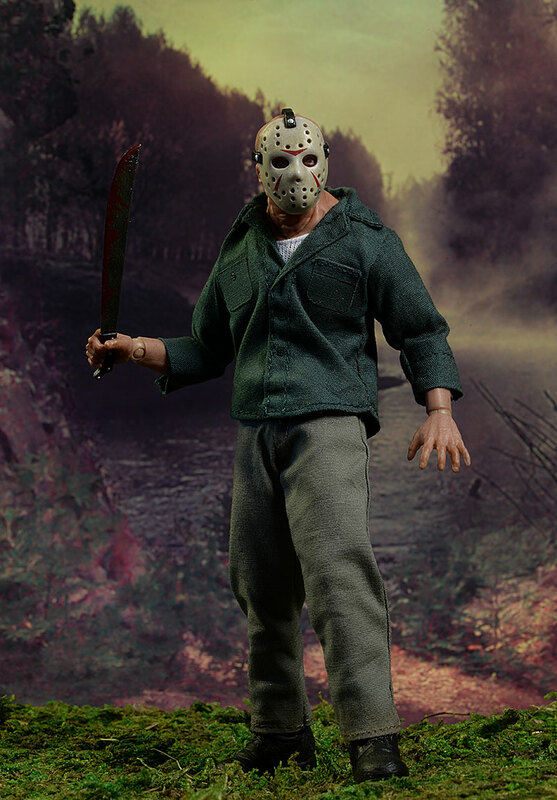 Mezco has done a great job with the classic horror characters of the 80's more than once. We're talking Freddy, Michael, Jason, Leatherface, Pinhead...they've done them in multiple formats, in multiple scales, and with both traditional and unique designs. The emergence of these characters in their current flagship series, the One:12 Collective, should be no surprise to anyone. 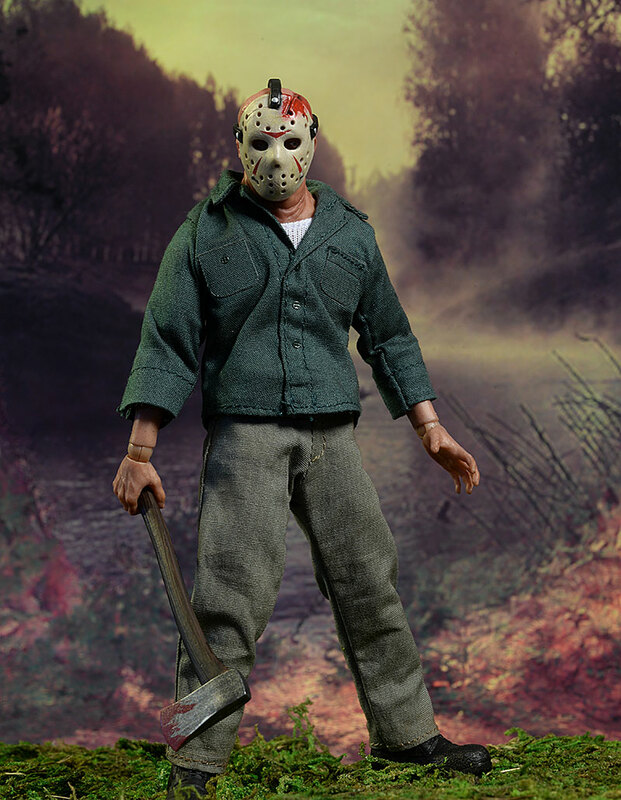 We already have Michael Myers in the series, and Jason Voorhees is now shipping. 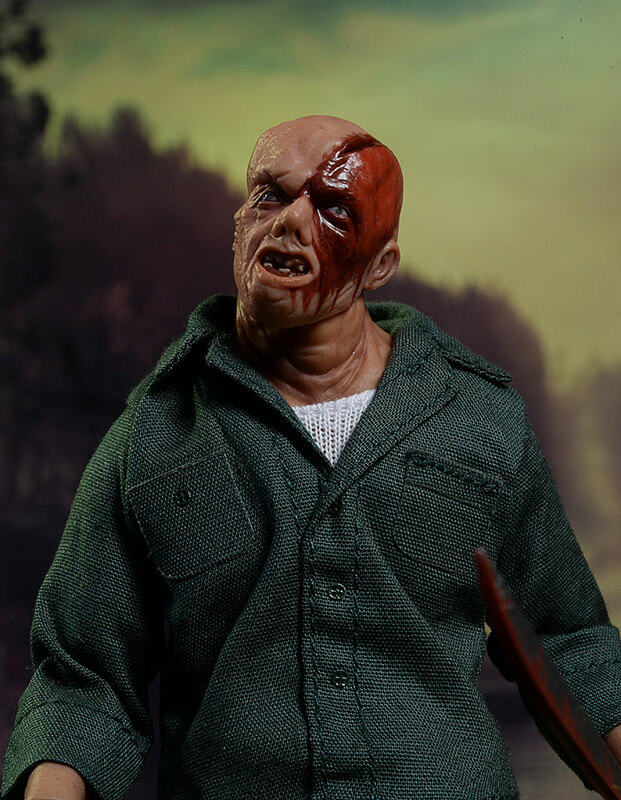 They have announced Freddy, and how far off can a Leatherface be? 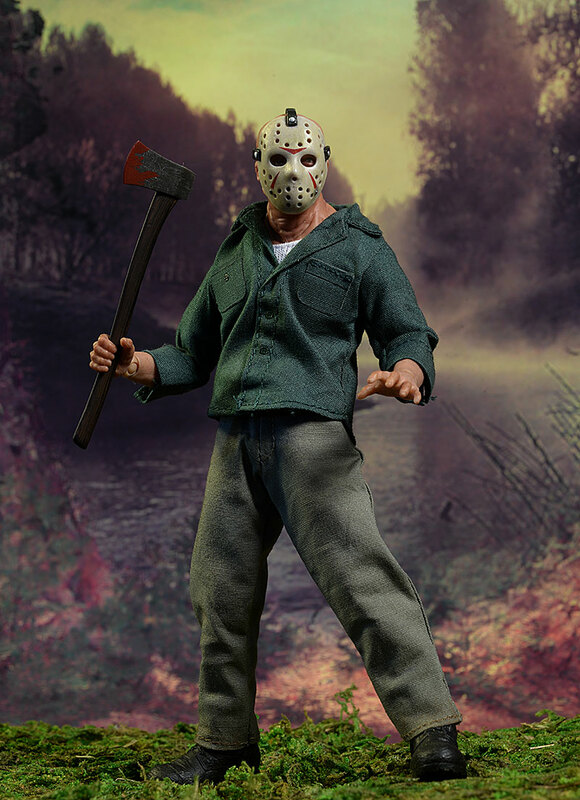 Jason is just hitting porches, and will run you around $80. This is the usual stuff, with a simple design, very sturdy cardboard, and collector friendly interior plastic trays. Remember to look in the lower tray - there's a whole bunch of extras down there along with the stand this time. 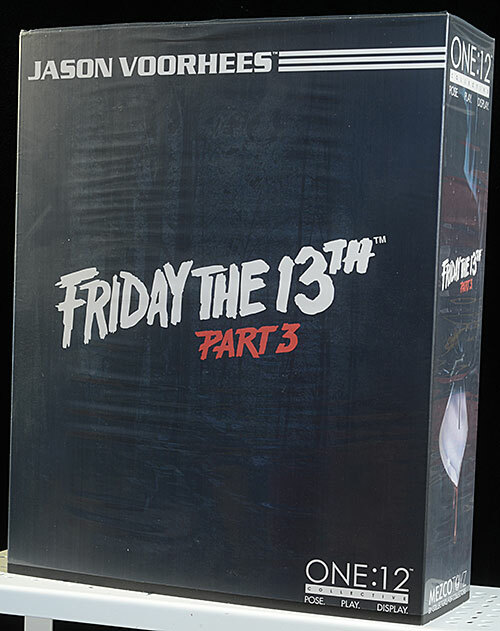 The package also makes it clear that this is Part 3 Jason. Why Part 3? 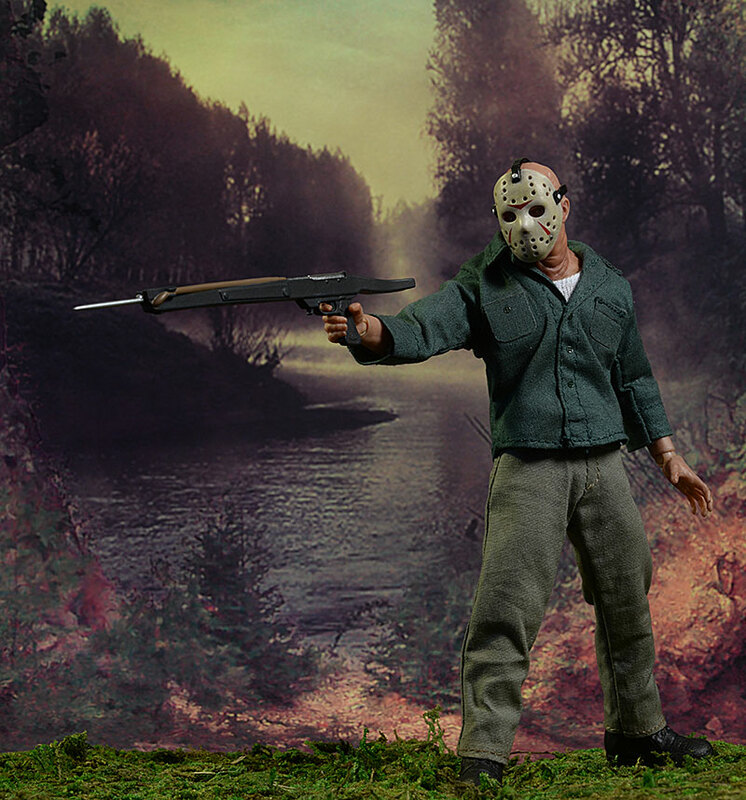 Because he's the best Jason, that's why. You get two portraits, and there are two masks to go with them. The standard portrait shows off his misshapen, damaged face quite nicely. The upper shoulders are sculpted with the thick, folded skin and a large hump. The skin texture and lumpy look extends seamlessly from the head to the neck to the top of the shoulders. The second head is damaged, with a large gash on the side of the head. The expression is pained...or maybe just pissed. Either way, it's a completely different sculpt, sporting the same amazing detail in the mouth and skin. 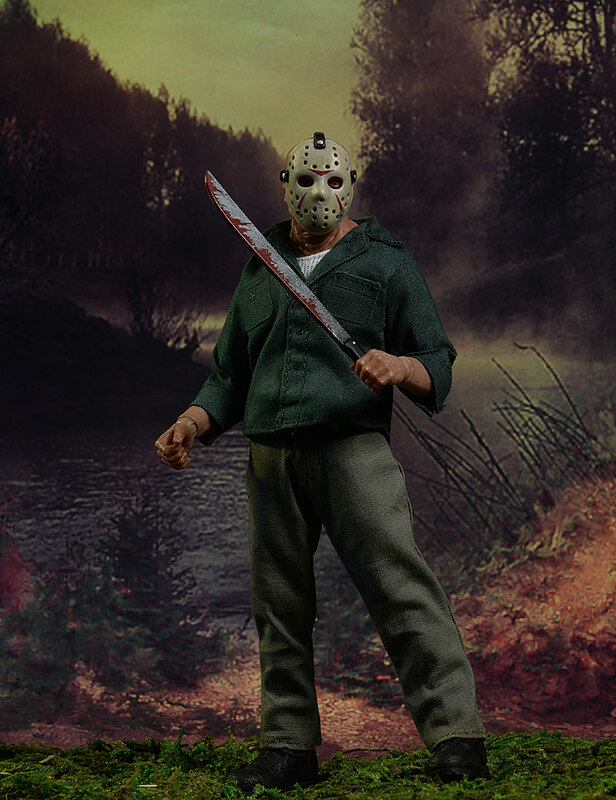 It's not really my favorite look for Jason though, simply because with his mask off he always seemed weaker to me. It also doesn't help that this design has a Sloth feel to it, a more sympathetic character. And so it's with the mask on that I'll be displaying him, and I'm betting you will be too. That's not to say having the mask removable isn't great - it is - but it's the sort of thing you'll do when showing off the figure, but not use for actual display. The two masks fit fantastic, and the second one has the same damage as the underlying head. More on that in the Accessories section. 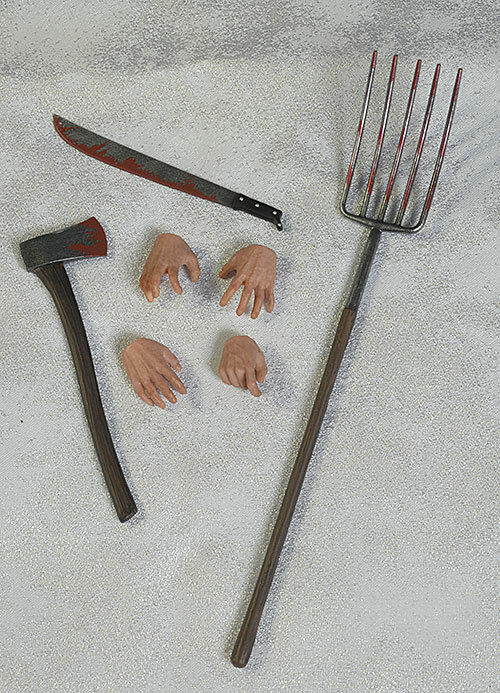 The hands are sculpted to work with the accessories as well as various poses. They swap easily, as do the heads. He stands about 6 1/2" tall. There's not as much this time to show off their paint skills, but the work that is here is clean and neat. The skin tone from the head to the neck to the shoulders to the hands is consistent and realistic. It highlights the textures, and gives him a life-like (or is that dead-like?) appearance. They eyes are good, although something about them isn't quite as realistic this time around. The blood running down the face of the injured portrait is terrific though, not merely brushed on but flowing down his face with a natural variation in thickness and consistency. There's some dirt and grime on the hands, but it's not over done or extreme. The clothes are very clean though, which is one area where I was a bit surprised. And the chevrons are perfectly aligned and straight. You know what I'm talking about. This body is as posable and mobile as you'd expect, based on previous releases. The neck has decent tilt and lean, particularly with the thick underlying sculpt. The shoulders are a little restricted, but I was able to get the arms fairly high when shooting the spear gun. The elbows and wrists work great, and the hands swapped easily without fear of breakage. The torso turns and crunches quite well, which adds a lot of personality to every pose. The hips are a little tough to work with, but I was able to get some natural leg poses. The knees and ankles work well, and there's enough rocker movement in the boots to keep the feet flat on the ground in shallow to medium stances. He has a ton of goodies, all designed for maximum carnage. I already mentioned the two heads and two masks. The masks slip on and off easily, but you can get them to fit perfectly over the eyes with the straps tight to the skull. You can also align the slit in the mask with the cut on the head, and embed the butcher knife if you'd like. He has a variety of hands as well. He comes wearing a gripping set that work with most of the weapons, but he also has a grasping set, a relaxed right, and a gun right (for the spear gun). And yes, there's the butcher knife or cleaver I already mentioned. 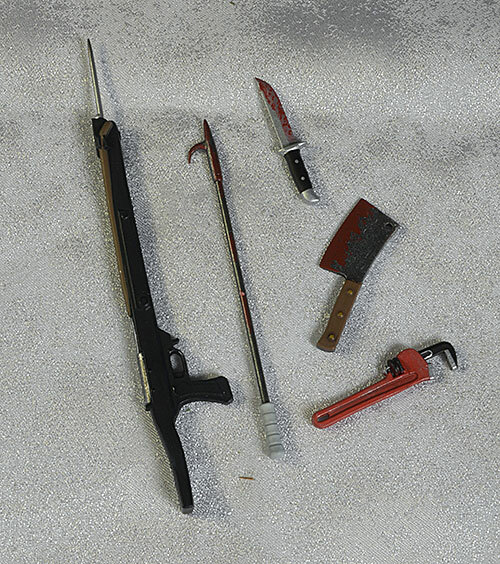 There's also a machete, a Buck knife, a pitchfork, an axe, a wrench, a spear gun, and a fireplace poker. The scale on all of them is very good, and the paint work includes proper blood spatters. Last but not least, there's the display stand, which includes both the simple foot peg and the larger, clear plastic support rod. It's a simple outfit, with just the white undershirt, work shirt, and work pants. Of course, there's also the boot sculpt, a nice design that also allows for good ankle movement. The fit is as good as poor Jason is going to get, thanks to his humped back. Pockets, buttons, and the collar are properly scaled, and the pants hang naturally. My one complaint, which I mentioned in the Paint section, is the lack of any wear, tear, blood, or grime. This is a great figure, with good articulation and a terrific assortment of deadly weapons. He'll terrorize the rest of your shelf, and look terrific doing it. Eighty bucks is the standard price for a regular release One:!2 figure right now, and you're getting lots of extras with this one. The quality of the overall figure, especially the paint and sculpt, make him well worth it. Not a thing. Do make sure you work the straps all the way down on the top of his head. They can rest up slightly if you're not paying attention, but it's not the fault of the figure. In the photo below, you can see what I mean. I didn't get the straps down far enough on the back of his head, and it allowed the top strap to sit up slightly. One of my favorite aspects of the One:12 Collection is the variety of figures. It's great to get the big characters from the current licenses - I ordered my Captain Marvel - but getting these classics from older movies and shows is an edge for them. Freddy is looking fantastic so far and will be the perfect finale to the trio. 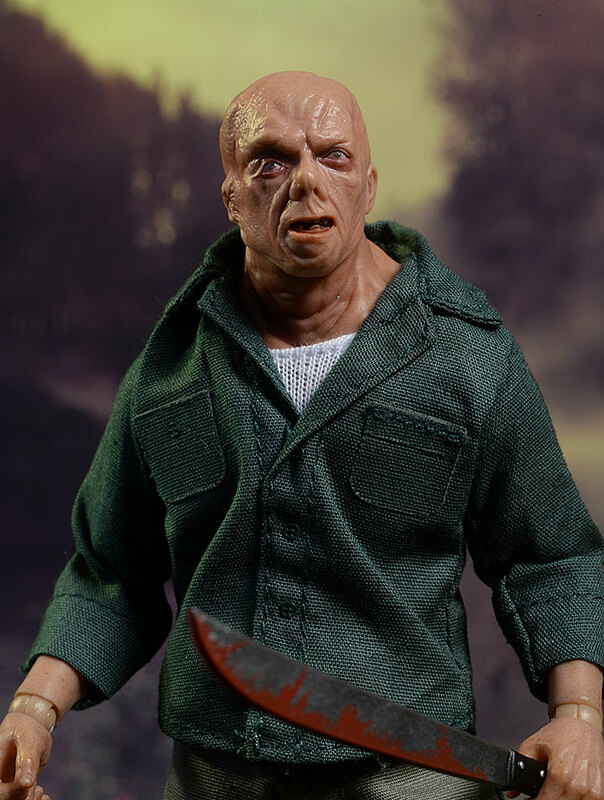 I have high hopes that we'll see other 80's horror icons up for pre-order as well. - Entertainment Earth are also at $80. 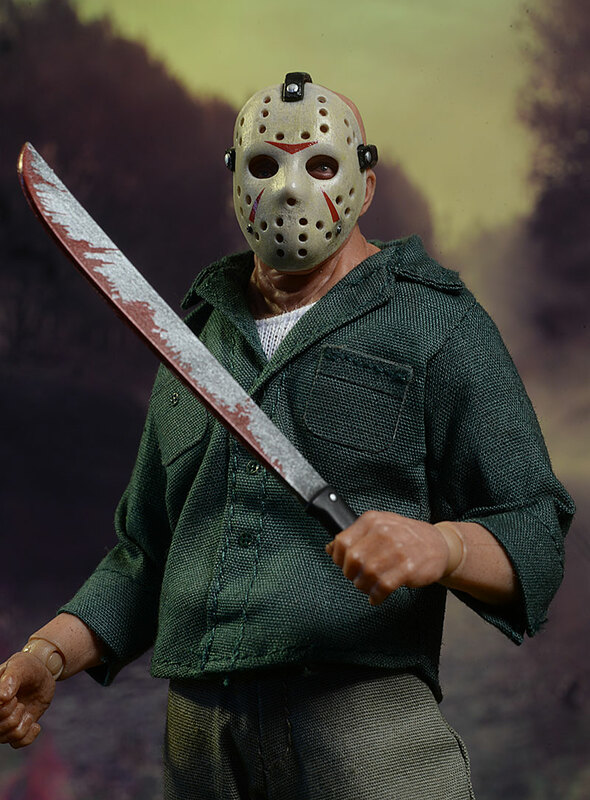 Mezco has already released Michael Myers in this series. 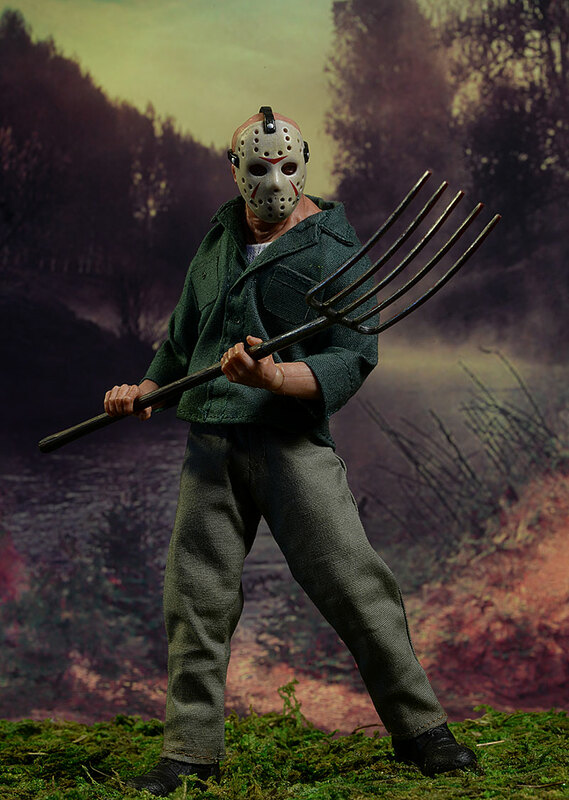 Other Jason figures include Mezco's terrific 4" version, the Kotobukiya statue, the recent sixth scale figure from Sideshow, and the sixth scale versions from Jason Goes to Hell, Part 6, Part 2, Part 3, and Freddy vs. Jason. Sideshow also did a great Premium Format statue. 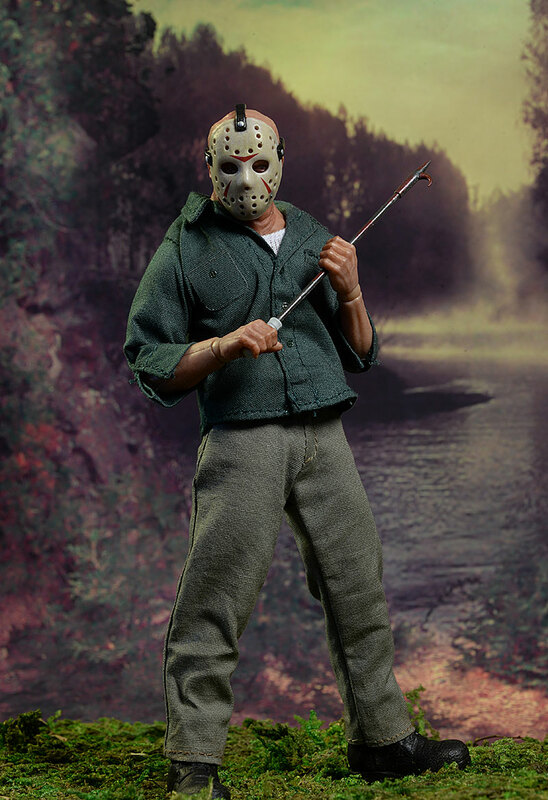 And don't forget the real start of Friday the 13t, Pamela Voorhees! 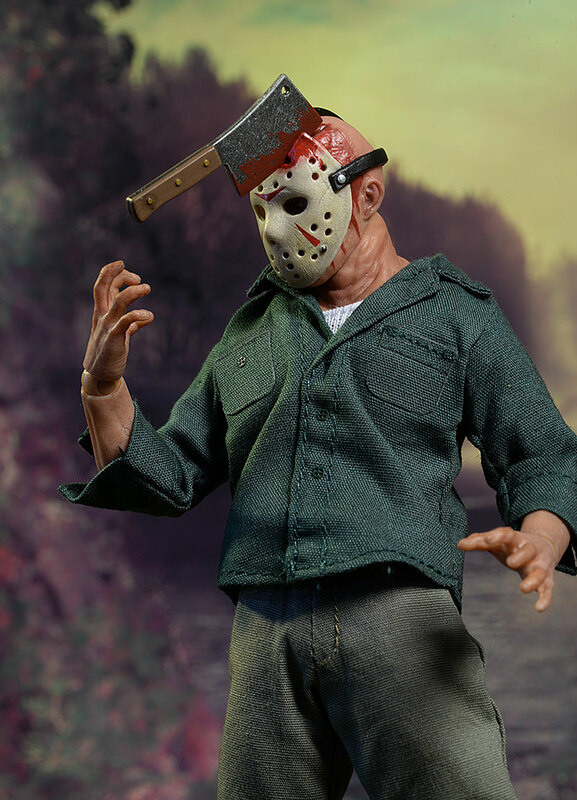 Other smaller versions include the Cinema of Fear Jason based on the remake (also from Mezco), Mezco's Part VII version, Mezco's cool stylized Jason, and NECA's Freddy Vs Jason set.